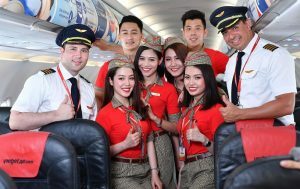 Vietjet has won AirlineRatings.com’s ‘Best Ultra Low-Cost Airline for 2019’ in the second consecutive year by the world’s only airline safety and product rating review website. According to AirlineRatings.com, Vietjet has quickly grown its fleet since its launch in 2011, and subsequently, its number of destinations have opened up travel to all, including those that perhaps couldn’t afford to travel by air before. “Vietjet has been very clever in its marketing, but behind that fun is also a very smart and serious business plan that brings affordable travel to millions,” said Geoffrey Thomas, Editor-in-Chief of Airlineratings.com. “What a great operation and one that is turning heads,” he stressed. AirlineRating.com’s Airline Excellence Awards are judged by seven editors with over 200 years of industry experience. The awards combine important safety and government audits, with 12 key criteria that include: fleet age, passenger reviews profitability, investment rating, product offerings, and staff relations. carrier’s flight safety performance and ground operation are also amongst the top in the region.